→Is Home Job Group a Scam Or Legit Work From Home Opportunity? Is Home Job Group a Scam Or Legit Work From Home Opportunity? Working from home is becoming more and more popular. There are nearly 3,5 billion nowadays on the Internet so the possibilities are literally huge. Some companies prefer to let you work at home because then they don’t need to rent expensive offices, pay desks, chairs and other things. 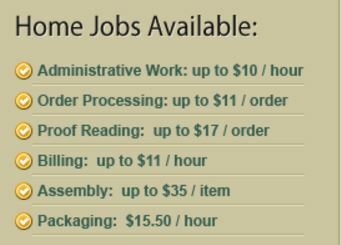 This service is supposed to companies and people who are looking for a job from home. There are still many complaints about this website on the Internet. Is Home Job Group a Scam? Let’s find out. Home Job Group is a website that promises to connect people who are looking for “work from home” -jobs and employers. They have a big list of jobs that they are offering and you can see some of them in a picture on the right side. This website’s idea is to work as a bridge between an employer and an employee. The Internet is great because it makes this kind of things possible. Home Job Group doesn’t promise you the workplace but they say that they’ll help you. They have fake jobs, fake pictures, fake numbers, fake promises, fake everything. Let’s go through a few things that show clearly that their program is a scam. I have experience of more than 120 make money online programs so I can easily spot a scam. In order to get started in Home Job Group, they ask you to give your name, email address, location and desired job. Then they show how many jobs are available in your area. This number is fake. Whether you are living in U.S., Canada, Austria, Finland, New Zealand, U.K. or any other country it always gives you the number 26. Even though that first it gave you the window, “System is searching for available jobs.” It doesn’t matter whether you registered on their website in 2014, 2016 or 2017, it always gives the number 26. Doesn’t sound very legit. => Tired of Online Scams? Learn to Make Honest Money Online! Some of the pictures of their Home Job Group owners are taken from stock photo websites. This is quite typical for online scams. My Home Job Search used the same trick. The picture of their CEO and for some testimonials were taken from the website that is giving pictures for free. Why are they taking their pictures from stocks? I don’t know but at least I know that it’s another bad sign. On their homepage they show that they have would have already helped more than 4,31 million people. It sounds impressive but it’s not true. It is a counter how many times their homepage has been opened over the last 8 years. The number is quite big but it’s explained easily. I have visited their page already quite a few times while making this review and researching their service. The counter moves up every time when I come to their website again. So, let’s say if I visit their site 50 times, they count it as “50 people helped.” Actually, they haven’t helped a single person during that process. They also claim to have more than 108,000 premium members which are for sure false. I can see from Jaaxy and Wealthy Affiliate’s keyword tool that their website is not getting very much searches on Google. I also confirmed with other tools that there is only very low traffic on their website. If they really would have 108,000 members or more, the numbers would be much bigger. Almost all reviews that I found about this program were negative. They clearly stated that this program is a scam and explained why. There was only one program that recommended Home Job Group but I know from experience that this website is not providing honest reviews. They are recommending every program just to earn affiliate commissions from their visitors. On YourOnlineRevenue.com we don’t recommend products that we wouldn’t use ourselves. For example, my #1 recommendation is Wealthy Affiliate and I have used their services almost daily since 2015. Home Job Group has an affiliate program with Clickbank which tells that you will probably get your money back if you want. Still, it takes your time and energy to go through the process of signing up, realizing it’s a scam and trying to get your money back. I would just prefer using time on better opportunities. Conclusion – Is Home Job Group a Scam? Home Job Group seems to be a scam. I wouldn’t waste a minute more of my time on their website. Too many fake things for my taste. I prefer concentrating on my online business with the principles that I have learned in Wealthy Affiliate. I know that you can also succeed online if you are willing to work. Anybody can learn how to create a successful online business. It takes some discipline and time but it’s 100% possible. I can offer you +12 hours of top-quality video lessons on how to make money online. In addition, you can create 2 websites for free and start building a profitable business. Some of my friends started in Wealthy Affiliate without any prior experience but nowadays they are making a full-time income and more. You can do it too but I want to remind that it requires work. Joining is totally free and you don’t need to use a single penny if you don’t want. => Want Earn Full-Time Income Online? Start Training in Wealthy Affiliate! How do you like to make money online? Would you like to learn to make it even better?